Today's learners have grown up in a media rich environment. From an early age they are bombarded with visual imagery that often uses narrative to engage them and sustain their attention. Across disciplines, students engage with images and visual materials throughout the course of their education. Although students are expected to understand, use, and create images in academic work, they are not always prepared to do so. Scholarly work with images requires research, interpretation, analysis, and evaluation skills specific to visual materials. These abilities cannot be taken for granted and need to be taught, supported, and integrated into the curriculum. Education has used visuals to help root academic information into the minds of young learners by association. Due to the plethora of media, older learners also benefit from tools that encourage visual learning especially when put in the context of visual literacy. By using Training of Thought, learners enhance their skills in evaluating visuals as part of developing their thinking skills. Visuals include everything from infographics and visual art, from videos to machinima. Training of Thought was born out of comics and uses the six characters as a through-line to better assure the retention of learners throughout their coursework. Penny's process reflects that of learners. Educators have used videos and films since the technology has been available to them. Some media is directly instructional, other media is exemplary or inspirational. Think of the cognitive benefits conventionally ascribed to reading: attention, patience, retention, the parsing of narrative threads. Over the last half-century, programming on TV has increased the demands it places on precisely these mental faculties. Today's media is more than a passive experience. Television networks are not only producing educational content they are supplementing that content with educational materials. Commercial media recognizes the need for more interactivity and include online content. Some reality show television programming encourage real-time exchanges with viewers. This significant shift can serve educational strategies. Educational programming is slowly expanding their audiences beyond K-12. 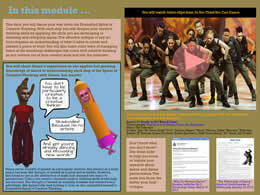 Training of Thought hopes to use content from reality shows as part of instruction. Partnerships with the production companies that share the target market will change how edtech is promoted, published and disseminated to learners. Stories do more than entertain and educate, they engage and sustain the attention of learners. A narrative approach to development, in contrast with other theoretical orientations, attempts to describe development from the inside as it is experienced, rather than from the outside as it is observed. Learners feel safer challenging the choices of characters rather than challenging their own choices. Projecting their fears and frustrations onto the characters is one way for learners to work through the emotional issues that arise as they develop thinking skills. Narrative learning can root knowledge in the minds of learners as though it were personal experience. Including a narrative arc that runs throughout an entire course no only inspires learners to complete the course, but brings the learning elements of that course together in a unique way. Who doesn't want to see how a story ends? 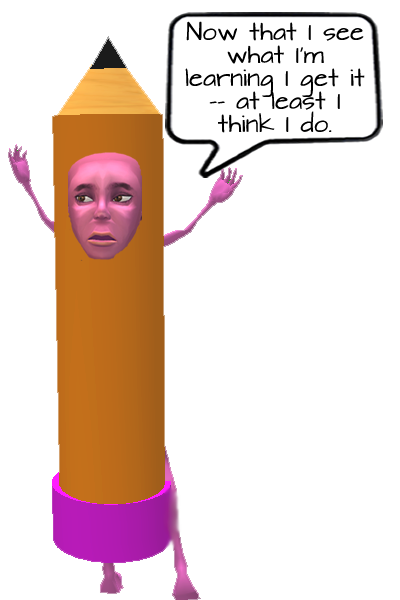 In Training of Thought, learners follow Penny as she develops thinking skills and applies them to writing Textman. They are also invited to tell their own stories as part of the writing exercises. Interacting in a virtual world happens in real time with real people behind each avatar. Individual and small group interactions offer a unique type of intimacy unlike other online interfaces. 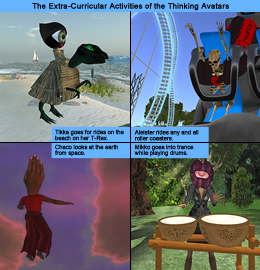 The characters of Training of Thought are avatars who can interact with learners in real time. Wanna check out a sample chapter?